We all have bad habits. As you know, habits are hard to break. Making a permanent change requires courage and determination, but for smokers, giving up smoking can feel like you need super-human strength and willpower. Unfortunately, super-human strength is only found in comics, and willpower can wilt as soon as a hurdle appears. Neuro-linguistic programming (NLP) is used by many people to make a permanent change in their life – whether that is a physical change such as packing in smoking or losing weight – or whether it is an emotional change, such as being more relaxed and calm in certain situations. Why is quitting smoking so hard to do? Smoking is a habit. It is something that you have become accustomed to doing at certain times of the day and, in certain situations. Nicotine, just one of many chemicals found in tobacco, is highly addictive. When you stop smoking, you are starving your body of something it is used to. Withdrawal symptoms include feeling flu like symptoms, problems sleeping, cravings, irritability and fatigue. You can also develop a cough, bringing up phlegm that looks and tastes unpleasant. Hence, when a craving strikes, your willpower is nowhere to be seen and you cave in. Every time you smoke just one cigarette, you bump yourself right back down to the bottom of the seemingly never-ending spiral of trying to quit. If you have taken time to delve deeper into NLP courses online, you may have seen that it is a method of dealing with quitting smoking. In fact, many people say that it is one of the most effective ways of dealing with cravings and other withdrawal issues linked to quitting. Understanding what NLP is will help you understand why it is an effective way of making a permanent life change. The words in bold are those that we are concerned with as we look at how NLP can help in the endeavour to quit smoking. As you stand on the precipice of kicking the habit forever, you will find yourself full of enthusiasm. What may be lacking is courage because, as you will know, from previous experience or watching friends and family, that quitting is a long, long road. It can be done, but the mind is key. You need to start believing that you don’t like cigarettes. You need to re-wire your brain. The following steps are not meant to be a prescribed programme, but a flavour of how NLP works. If, after reading you too can see the value in the process, enrolling on NLP courses online would be the next logical step. Various NLP courses will use different methods but they all focus on one thing – helping your mind to understand that you don’t need or want cigarettes. Now think about these three instances and play them over and over in your mind. Increase the volume of these thoughts in your mind. Cigarette tar forms in your lungs. You probably cough this up, disgusting brown tarry phlegm accompanied by an unpleasant, deep gurgling sound. Think of this sight, creating a vivid picture in your mind. Now use smell to remind you of how unpleasant smoking is, the smell of cigarettes on you, your hair and your clothing. Think about what happens to your body when you pick up a cigarette and smoke it. It used to relieve stress; it used to be good; it used to relax you, but no more. It sizzles; it is too hot for your lungs, smell and, foul tasting. You could use a paragraph such as this or, you may decide that writing your own will be more effective. There may be specific things or instances you want to mention in your paragraph. You have the action – the left thumb knuckle pushed against something hard – you have the above paragraph to use or you have created your own. As you read the above paragraph, you may have felt self-conscious, embarrassed or a little bit silly. Which is why step two is all about reinforcing this negative anchor. Keep reading that paragraph (or your own). As you do, add more negativity to it. Read it as if it is typed in CAPITALS and that someone is shouting at you. Keep pushing your left thumb knuckle into a hard surface. The above doesn’t paint a pleasant picture. You have the pain and the soreness of your left thumb knuckle, and you now have some graphic, unpleasant images in your head. You have a vision of your lungs, brown and clogged with tar. You can possibly smell the unpleasant, disgusting smell. You are really starting to develop an aversion to smoking and its effects on you. Some of these images will be specific to you. You might realise that actually, you do want to be part of your family for as long as possible, to be around for the grandkids and so on. 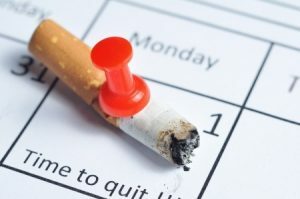 By not smoking, you are adding extra time to your life and not just minutes, but hours and days – hours and days of a happy, healthy life where you can be part of everything that goes on, not having your life ruled by needing or wanting to smoke. Keep talking through the negative paragraph. Build it in volume, energy and intensity. Reinforce it by pushing your left thumb knuckle into a hard surface. Continuously do it, and not just when you fear a craving will strike. Do it again, and do it now. Do it five times, keep reinforcing the negative message but also what you are gaining from not smoking. According to research, a craving for a cigarette last for only a few minutes, sometimes seconds. But go and talk to someone who has, or is trying to quit smoking, and they will tell you that this urge to smoke is overwhelming. The withdrawal symptoms peak three days after quitting, lasting up to two weeks. 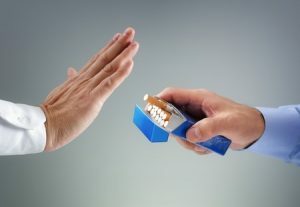 Some websites will advise that after this time, you can consider yourself an ex-smoker as staying a non-smoker is easier after the initial fortnight period. In the meantime, these cravings will strike and this is where your negative anchor comes in. Push your left thumb knuckle – feel the discomfort – and talk through (shout in your own head if you need to!) the negative paragraph you have created for yourself. Helpful hint – some people find that writing down why they are quitting smoking and what they get from it, incredibly helpful. This is certainly true when making other changes too. So the next time you reach into the biscuit jar, why not have a negative paragraph in your head as to why reaching for fruit would be a better option? Do this for as long as you need and then, as the craving passes – and it will – re-iterate all the great things about not smoking. Congratulations, you have added five minutes on to your life; five more minutes you have with your kids; five more minutes to live life to the full. Quitting smoking is hard. You will feel rough as your body physically craves a hit of nicotine. You may feel very ill, so much so that you need to take time off work. You may be irritable, with those closest to you bearing the brunt of your tardiness. Willpower can fail; courage can desert you, but with NLP, you will have the skills needed to make an important change such as quitting smoking. No one said making a change is easy. From quitting smoking to losing weight, being healthier, or learning a new skill, a Neuro-Linguistic Programming Diploma will equip you with all kinds of skills to help you make changes.